Stability. How does bamboo compare to other timbers? Dimensional stability of wood refers to how much wood will bow, bend or cusp when exposed to moisture. All woods are affected by moisture, which causes it to expand or contract. Depending on the type of wood and how it is cut, the movement is typically across the grain of the the wood. The higher the coefficient, the greater the movement that takes place. Why is dimensional stability important? Raw material cost and time savings. If you are making a furniture piece or some DIY woodworking project and the wood bows or cups easily, it means that it’ll take longer and require more skill to prepare and assemble. You’ll need to brace the components to keep the design stable and in the correct shape. This often requires extra materials, resulting in a higher amount of wasted timber. Manufacturing for a project such as a hotel where delays due to dimensional stability issues could mean penalties and repairs. The longer it takes to manufacture, the more it costs you & the less profit you make on the job. Fewer post installation or manufacturing comebacks. Nobody wants to have to fix or redo a job after it’s been completed. With furniture, this movement often only happens after the product has been shipped to the client. This often results in costly repairs, eating away at your profits. Bamboo’s inherent stability means that it’s the least likely to start pulling apart, bowing or cupping when exposed to excess moisture or sudden changes in the local climate. We have a number of cases with installed floors where there has been water damage & the bamboo has fully recovered. 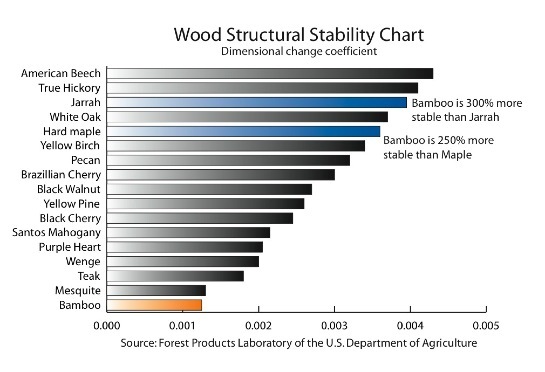 As you can see by this chart – bamboo as a raw material is very stable when compared to other timbers. Bamboo has a tangential dimensional change coefficient (the amount the fibers will expand or contract) of 0.00144. This is a better dimensional stability than top performing woods such as Hickory, Oak and Teak. When considering the above graph, you need to keep in mind that most architectural bamboo board, plywood and panel products are manufactured. The manufacturing process employed is critical to the stability of the end product. We provide some important things to look for when choosing an architectural bamboo product on this page.